All of these communication options are referred to as channels. You decide what channels you want to enable in your Zendesk account and how your customers can reach you. You can open even more ways of communicating with your customers by adding apps to your account. These give you additional functionality and connect you with many popular internet products and services such as Salesforce, JIRA, and SugarCRM. 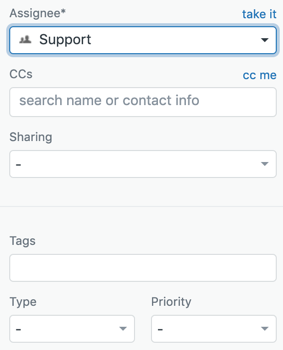 All support requests, from all channels, become Zendesk Support tickets. Tickets capture your customer's initial request for support and all the conversations your agents have with the customer along the way to solving their support issue. If you've already set up your trial account, you can create a test ticket right now, start testing out Zendesk Support, and see what a typical ticket looks like. Imagine you've just purchased a new product (in this case a camera) and something's not working correctly. You’re going to ask for help by requesting support using your email account. Send an email from an email account that you did not use to set up your Zendesk Support trial to your Zendesk account. You do this by simply addressing an email to support@thenameofyouraccount.zendesk.com. When you send the email, a new ticket will be created. Log in to your Zendesk account, then click the Views icon ( ) in the sidebar. You'll find your new ticket in the Unassigned Tickets view. Click the title of that view. Click the title of the new ticket to open it. We'll take a look at all the components of a ticket on the next page. With your new ticket open in front of you, you can see that the support request you submitted earlier is the first comment on this ticket. Above that you see that a new empty comment is open and ready for you (as the agent) to enter a response. By default, a comment you enter as a public reply will be public and visible to everyone who views this ticket, including the person who requested support. You can also add private comments (referred to as an Internal Note). The requester never sees these notes, they are used for internal communication only. For example, an agent may need to get advice from another agent to solve the requester's support issue. If you want to add an internal note, just click that tab. Just below the title of the support request, you see the date and time the ticket was created and where the ticket originated from. In this case, the request was sent via email. 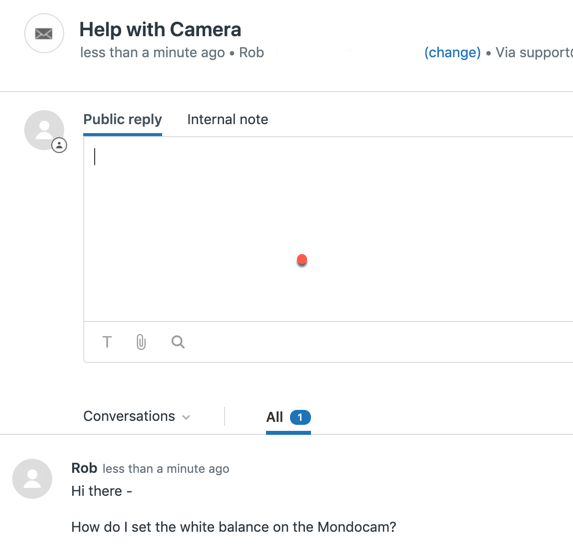 Zendesk shows you what channel was used to generate the support request. To the left of the ticket conversation you'll see the ticket fields. For now, we're only concerned with the Assignee field (we'll explain the others in another lesson). All tickets need to be assigned to an agent so that they can be solved and closed. Assuming you've just started your trial account, you're the only user in your Zendesk Support instance so in the next step you'll assign the ticket to yourself. Every ticket contains the name of the person who requested support, referred to as the requester. Once an agent is assigned to the ticket, the agent becomes the assignee. If an agent opens a ticket for a customer, the agent is the submitter. Open the ticket you created, then click the down arrow next to the Assignee field and select your name. Alternatively, to save searching for your name, click take it next to the Assignee field. You can also set the Type and Priority fields. Each are drop-down lists with pre-defined options. Set Type to Problem and Priority to Normal. To save these changes click the Submit as new button on the bottom right of the page. When you assign a ticket to an agent, it is automatically set to Open. After a ticket is assigned to an agent, they'll work to solve the ticket and ensure that the customer is happy. Some tickets can be solved with a simple standard response for a common issue such as resetting a password. Other issues that are more complex may require research, collaboration with other agents or people within your company, or gathering more information from the customer. How are tickets assigned to agents? Tickets can be assigned both manually and automatically. You can manually assign a ticket to yourself or to another agent, allow agents to assign themselves to tickets, or you can set up Zendesk Support to automatically assign tickets to a group or specific agent. You'll most likely set up a mix of both manual and automatic ticket assignment. Some larger support teams delegate management of their ticket queue to a support lead or manager and those people assign tickets to agents. On the next page you'll see the typical journey a ticket takes from arriving in Zendesk Support to being solved. Each ticket has a life cycle. In other words, the stages it goes through as it arrives in Zendesk Support until it is solved. When a Zendesk Support request first arrives, it becomes a ticket and is automatically set to New. When an agent is assigned to the ticket, the ticket is automatically set to Open. If the agent has a follow up question for the customer, the agent will set the ticket to Pending, which means that the agent is waiting for more information from the customer. When the agent resolves the issue, they will set the ticket to Solved. Finally, after a certain number of days, the ticket is automatically Closed and archived for later reference. Agents will never manually set a ticket to closed (which is why you don't see it as an option on the Submit button). Agents expect that when they set a ticket to solved the customer's issue has been resolved and the conversation around that particular issue is over. However, if the customer doesn't feel the same way, they can respond back to the agent by replying to the "ticket solved" email notification. When this happens, the ticket is reopened and it's the agent's job to follow up and go through the ticket lifecycle again. In the next lesson, we'll show you how you can view your tickets using any number of criteria. 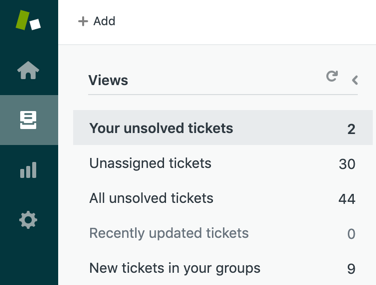 For example, you can quickly see all the tickets that have been set to Solved, all the tickets assigned to a particular agent, and so on. Tip: The final stage in the ticket lifecycle is understanding your customer's happiness with the support you provided. In Zendesk Support, you can enable a brief customer satisfaction survey to be sent after the ticket is solved. The customer is asked one simple question with two possible answers. Before you move on to the next lesson, watch this video that gives you a quick tour of Zendesk Support so you know where to find all the tools you'll use to manage your tickets and users and configure Zendesk Support. Thanks for pointing that out! I've reached out to our documentation team to get that corrected. The video should be back up there soon! Any updates from your documentation team? These lessons aren't super helpful without the video. The videos in the tutorial were blurry when my team and I were viewing them last week. Is there a way to make them clear and easier to read?